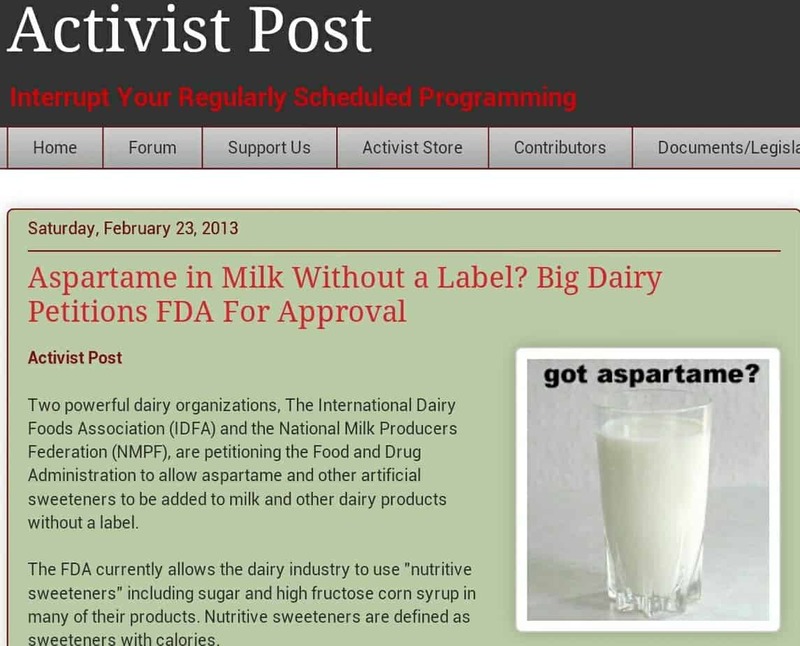 While many of these posts are trying to convince their readers that not only is the FDA going to start allowing aspartame in milk, they are going to allow it without BEING LABELED!!! PANIC! PANIC! PANIC! Oh, and according to the internets, they have already been allowing sugar to be added to our milk to make kids want to drink it and all without being labeled! OH THE HORROR!!!!!!!! Guess what? They are wrong. Regardless of how you feel about aspartame, let’s look at the facts here. 1. There is a difference between labeling and ingredient statements. What NMFP & IDFA is asking for in the petition is the ability to add aspartame to dairy products without having to call their product something other than milk. The FDA is very picky about what you are allowed to use as an ingredient and still be allowed to call the product milk. Because they want you to know that what you get is what you meant to buy. Labeling and nutrient claims is not the same as an ingredient statement! From the NMPF Facebook page. 2. If aspartame is included in a milk product it will be listed in the ingredient statement. In absolutely no way is the FDA going to allow an ingredient to be added to milk and not have it stated on the ingredient label. NMPF and IDFA are NOT asking to be allowed to hide aspartame as an ingredient. Same with sugar or Vitamin D. Take the jug of milk out of your fridge and look at it. There will be in ingredient statement. If anything is added to your milk, it will be listed there. Reading is fundamental! I guess the Activist Post and others missed this part of the petition. 3. So why add aspartame to milk? Well aspartame has no calories. Used in place of sugar it would make flavored milk, like chocolate and strawberry lower calorie than it is now. Like drinking a diet soda instead of regular soda, if soda also had essential vitamins and nutrients. Which of course soda doesn’t have… Which leads us to why kids should be drinking milk in the first place. So the skinny on this… If aspartame is allowed in milk it will be included in the ingredient statement, you will know it’s there. It won’t be included in all milk. It will not be hidden from you. You will be able to make an informed choice in the grocery store just like you always have! « Shocking undercover dairy video hits home. 102 Comments on Is There Aspartame in Milk? Very good information with great clarifications. It is amazing and sad how quickly people can jump on a headline and not search out the reality. Thank you Carrie! I also wrote a post addressing if aspartame is in organic milk. Well said, yet again, Carrie! Keep up the great educational work! Thank you for putting an end to the crazy making. Although it sells, misinformation doesn’t help anyone, and if it keeps people from using dairy products, then it actually hurts. Isn’t there a law against crying “fire” in a crowded movie house?!?!? Well said! Thank you for setting the record straight. Take the milk jug out of the fridge… and read it! I love this. The media all too frequently either cannot research and practice critical thinking, or chooses not to in lieu of sensationalist hoo-raw. Funny thing is, already many consumer products have aspartame and similar sweeteners used in concert to reduce the caloric content they have to list. I’m of the mind that it’s a bit of an end run around proper nutrition and serves only for calorie counters/USDA rules, but it is commonplace and no controversies are being publicized by people eating Atkins bars or whatnot. Father was a farmhand in the mid-50’s, and his continued interest through the years bit me, I guess. He once was milking a cow – got kicked by the cow that he was milking, and crapped on by the cow in the stall behind him immediately after. Still makes me laugh; hope you enjoy the visual. Thanks for writing Judy. There really wouldn’t ever be a reason to add aspartame to milk. Just like there isn’t a reason to add sugar to regular white milk. I doubt that all flavored milks will go this route if it is approved. FDA cannot be trusted….they are working for big business. First GMO’s, pink slime, and now this. Milk is for calves….and unless you can drink your mother’s milk. Dont drink it. Well we will have to disagree on the milk issue, but you knew that already. I don’t mind your comments here so long as they stay respectful. If you read any info on cancer prevention or to heal the body if you have cancer. The recommendations are always to cut out red meat and dairy. Please educate yourself. Are you an oncologist? Are you her oncologist? If not I don’t think you should be handing out medical advice on the internet. To me the controversy is how UNhealthy aspartame is. Low calorie or not it isn’t healthy, while calorie free it’s not any improvement over HFCS just different issues. True people can read labels but few do. Hey Gar…..I concur!!!!! You are RIGHT on the money. Labeled or not I would not want my child drinking milk contain aspartame! I do not go to school with them stand in line at the lunch counter and choose their milk for them. A six year old does not have the mental capacity to read the label and say “oh Aspartame my mom told me to stay away from that!” I know that anytime I have consumed it without knowing, within an hour I have severe headaches. The bottom line is it shouldn’t be put into our children’s milk AT ALL! Labeled or not, it would discourage more health conscience people from drinking it. Aren’t we trying to encourage more people to drink milk? In my opinion this move would do the opposite. You have valid points. Not trying to debate aspartame as an ingredient just clarifying the facts about the petition. I understand that you are just clarifying the facts about the petition, but in my estimation aspartame should not be added to any food or drink. What’s wrong with using stevia as a non-caloric sweetener instead??? I don’t know what the reasoning is for aspartame over other options. It’s so much cheaper. They want to be able to feed children (the target for marketing chocolate milk, ice cream and the other dairy items that use artificial sweeteners) while keeping their costs down. It also helps the pharmaceutical companies and doctors years down the road when those same kids have exorbitant medical bills from all the junk that companies insist they eat because it has more calcium than white milk or as much fiber as an apple. Apples and white milk just don’t give them enough profit. Can you explain how you feel that chocolate milk with non-nutritive sweeteners rather than sugar has a greater profit margin than regular chocolate milk that uses sugar? Aspartame is only one of the options. Stevia, Monk Fruit juice and other non-nutritive sweeteners are also covered in this proposal. 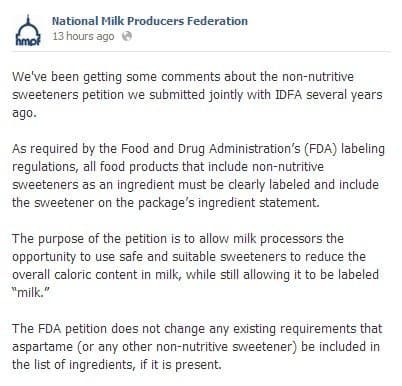 The petition that NMPF & IDFA filed was to add any “non-nutritive” (or non-caloric) sweetner to milk. This would include stevia as well as aspertame, and indeed with that being an option that has less controversy associated with it they may decide to go with stevia in place of aspartame in the end. This petition allows both options, the current law only allows sugar. Most of the coverage of the topic has used aspartame because it can rile up an audience, whereas had they said that groups were trying to add stevia to milk it wouldn’t have stirred up any controversy. As one of the 1 in 10,000 (or so I’m told) who can taste the difference between aspartame and sugar, I’d much rather that they use stevia as well. Thanks for your clarification on the topic. Great job Carrie. I’ve been communicating with my dairy cooperative. I personal am against the addition of aspartame. Why muck up a great product? As a dairy producer I find myself trying to educate the public on the hysterics that are our there and I just don’t see any benefit to this. I will continue to voice my concerns and learn more about it. Thanks for your great article. Holy cow! Thank you for your post. I have shared it all over facebook today, trying to let people know the facts. It’s crazy how this is spreading like wildfire! Hi, Thank you for clarifying this. I’m kind of tired of all the alarmist groups out there who hype everything up. I’m wondering though, what about when milk is an “ingredient” in something else? How do we know whether or not aspartame has been added to the milk that was added to product X? I personally do not want aspartame added to anything I ingest. I’d rather get the calories than that stuff. Thanks for being a rational “other side”! If aspartame is an ingredient in milk and that milk is used in something else it would still be listed on the ingredient label. Look at some ingredient labels and you will see an ingredient listed and after that ingredient in parentheses you will see what ingredients makes up that ingredient. Regardless of whether people understand the current changes and their exact promotion – IF milk has additives, should that not be clearly visible without having to take out my reading glasses? If some cheese has to be labeled as “cheese product” or “cheese food”, for example, would it not make sense that milk with additives of any sort should have to list it RIGHT ON THE FRONT LABEL? Alarmist information is everywhere, but at least it can lead you to research for the truth. Maybe, but we allow and don’t think twice about strawberry milk having artificial colors added to it. Would that be one of the artificial colors linked to hyperactivity in children and banned throughout much of the world? I personally ALWAYS think twice about anything with artificial colors added to it! And you can make that choice for yourself. Others can choose differently. As someone who had to eliminate aspartame from my diet because of health reactions I think the idea that they would want to add it to milks fed mostly to children is reprehensible, no matter what the labeling requirements are. The sole reason – on their own petition – is they think the label “low calorie” turns off children. That’s STATED in their petition. They even acknowledge that it’s a “non-nutritive” additive. Why would we add something with no nutritional value to milk? Just makes me angry that we can’t have one chemical free thing for our children. instead we have to spend an extra hour reading the 2 pt type on a label and have to coach our children to do the same. This isn’t alarmist reaction – this is a mom saying enough is enough. It’s up to all of us to voice our opinions, either now in the petition process or with our food dollars. I wrote this post to clarify a lot of the half truths I saw out there. I want people to vote knowing all the facts. At present when I go to the dairy section and buy flavored yogurt I can tell at a glance whether the product contains aspartame. How? Because there is a prominent label on the front of the container. Now I, like many people over 40, struggle to read many of the “content labels” because they are purposely relegated to miniscule and fuzzy print that requires reading glass examination under a bright light. So no, removing the need for prominent labeling is unacceptable. I would rather my kids ate yogurt sweetened with sugar than your foul chemicals. We have struggled with the food industry, as consumers, for years. Rennet, animal stomach enzyme, is still used to create cheese in America, years after the Europeans switched to bacterial enzymes. I had no idea how my cheese was made until a vegan friend pointed it out. Now you and your ilk have launched a wholesale attack on organic products, seeking to stick labels on products as organic when they clearly aren’t. You say a hen is cage free when that might only mean it had a few months out of a cage. You mince terms like natural ingredients into the equation to obfuscate the truth behind food production and then you have the gall to claim innocence. My wife is a celiac. Thanks to people exactly like you I have to take with me to the store a long list of gluten-containing chemicals because you are not required to label food as containing gluten. Even that isn’t good enough as quite often chemicals are exposed to gluten during manufacture and carry it in trace amounts. All of this because you think it is okay to turn our food into chemical cocktails. You line your cans with BPA and we the consumer are left trying to guess if you are exposing us to toxic plastics. The list of your crimes, or the crimes of people like you, is legion. So spare me your indignation. It may be that aspartame will still be listed in miniscule print on the back of the packet of tub, for those with young eyes and the patience to read each and every label, but you are a part of our nutritional problems and I am ashamed for you. Reading this again and I have to be honest, I don’t think you took the bitter pill, you forgot to take your pills…. only thing that makes this make any kind of sense. dairycarrie — alastair may come across as very passionate, and some of his comments, though valid, are not dairy-related, but take heed: there are millions like him and like me who are skeptical of the dairy industry because of efforts like this one to obscure the use of chemical additives from us. it creates lack of trust. the dairy industry can learn from people like us, so pay attention. I am willing to learn! I want to learn. My mind is open. Please understand that this post is to provide more information about the subject so people can make informed decisions. If you really want to learn please learn from various sources. Including dairy farmers. Well said, Kathy. I grew up on a dairy farm, long before the days of such abhorrent practices as adding poison to our food. I have good friends today who are dairy farmers, so yes, I get my information from various sources. 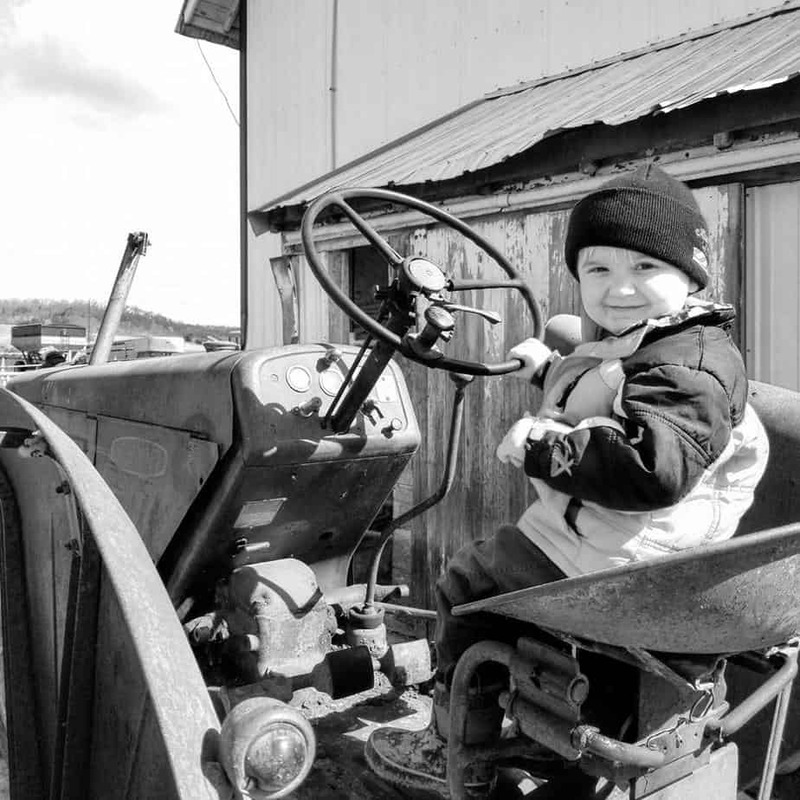 While I respect and appreciate my dairy farmer friends– one of whom allows us to buy his hormone-free raw milk, God bless him!– I am highly skeptical of the dairy industry as a whole. Sorry, but I can’t buy the idea that it’s ok to label a product as “milk” when a poison has been added to it, no matter how you clarify, explain, or “provide information” on it. Yes, clearly providing information so people can make informed decisions deserves your snide comment. You don’t have to lime the idea but the truth is still important. It’s not OK to bend it to fit an agenda. By the way, there is no such thing as hormone free milk. Of course there’s no such thing as hormone-free milk. Of course all milk has naturally occurring hormones in it. I’m sure you know I meant no hormones added. And yes, the truth is absolutely important. On that we can agree. However, I can’t agree that the IDFA and the NMPF and the FDA are as concerned about truth as you and I apparently are. They want to peddle poison and masquerade it as a healthy alternative. It seems like (and this may feel snide to you, though I don’t mean it sarcastically) you want to defend them under the guise of truth-telling. I’m sure you see it differently. Judy, your right, I am often sarcastic as well. I’m a real person. I don’t know that you know that there is no such thing as hormone free milk because many, many people don’t understand that. As far as my post goes, you don’t have to like aspartame. I’m not trying to convince you to. The internet decided to spread rumors that the proposal was to sneak aspartame into our milk. This is not true and I felt the need to point that out. You want to think that this blog is me showing support for the idea? Fine, you can believe what you want. The truth is that I drink diet soda so I’m obviously not worried about aspartame. However if the masses don’t want aspartame as an option then they should make their voices heard. But I expect people to use the truth to persuade and not scare people onto their side. I can see on the backside of my blog what terms people enter to reach my blog and I am already getting people looking for “what brands of milk have aspartame” and “does all milk have aspartame in it”… so the truth has already turned into a very different animal. This is what I am up against. Activists who use scare tactics rather than facts. This is why I blog, to provide sanity in among the crazy. Food companies cannot please everyone. While you may prefer cheese made using bacterial enzymes, others may prefer the more “natural” rennet. While it is not correct, many people equate using any alternative organisms in their food as GMOs. The topic of sugar vs non-nutritive sweeteners in schoolchildren’s food reminds me of the many letters that I wrote to the administration of my son’s middle school, pleading with them to remove vending machines containing high-sugar beverages. While sugar is a natural sweetener, it can cause some nasty behavior issues in children. The fact is, there is no perfect food regulation or agricultural practice. There are both positive and negative aspects of most issues that you will see on any food blog or discussion board, and everyone owes it to him- or herself to try to tease the facts from the hype, and make their own decisions. I think another important point to mention is that the the petition is only to allow non-nutritive sweeteners in characterizing flavorings. Per CFR § 131.110, “The name of the food shall be accompanied on the label by a declaration indicating the presence of any characterizing flavoring, as specified in 101.22” – this limits this to Strawberry milk, Choco-Frosted Cocoa Bubble Blast Milk, etc… not plain milk. Considering how many unexpected products contain sucralose (Starbucks energy, Capri sun, DiGiorno), or have reinterpreted “Reduced Sugar” to instead mean “Partially Non-Nutritively Sweetened”, etc, it wouldn’t be alarming to find it in some nasty sugary flavored milk or Dora the Explorer yogurt. Unfortunately people that care about what they consume have and will always need to read the ingredient list. Yes! Thank you for clarification on that point. Except they also want to add it to other products…like sour cream. What sour cream is chocolate flavored? this is my first time on this site. my impression is that “dairycarrie” is a shill for the dairy industry, and i assume receives some sort of compensation for it. as for her response: “There really wouldn’t ever be a reason to add aspartame to milk. Just like there isn’t a reason to add sugar to regular white milk. I doubt that all flavored milks will go this route if it is approved.” — this is wrong. sweet foods sell because the human brain craves sweetness. it is hard to find any prepared foods without sweeteners added. of course the dairy industry will start sweetening plain milk without labeling it if that is allowed; it would be the logical next step. i can’t believe that the industry thinks it is normal that i should have to seek out a tiny ingredients list on a package labeled “milk” to look for chemical additives. the industry is driving people like me away. 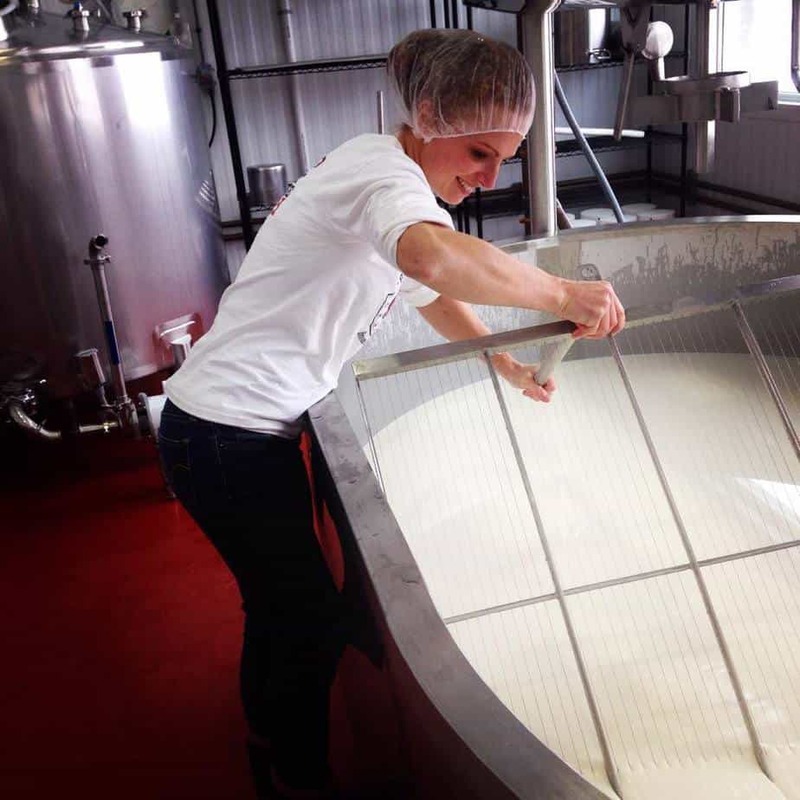 to the dairy industry: if you are proud of what you are selling, then be proud enough to declare it on the label! Wow, can’t believe it took this long to be called a shill. Why is it that it you feel you can discredit opposing opinions to yours as having to have been paid to think that way. The word shill gets used so often now as an accusation that it’s pretty laughable. I have often wondered why, it seems, many people neglect to look intently at ingredient statements instead of focusing on the bold front which is generally all just a bunch of marketing. Ingredient statements are unforgiving. It is the first thing I look at when choosing foods at the grocery. Why, if I may ask, is the flashy front more important to you than the always telling ingredient statement? Milk has had vitamin D added to it for a long time. That’s an ingredient and that’s on the ingredient label. And again, if this were to be approved it would be used in flavored milk. Flavored milk obviously has more than just milk in it. Nobody seems to care that strawberry milk is called strawberry milk even though it may have artificial colors in it. this has all been quite an eye-opener! i will be much more cautious about buying any milk products in the future. You didn’t know that strawberry milk might have artificial flavors in it? I can understand that if we were talking about regular white milk. If it is a flavored milk, do you not think it important to check the ingredient statement to see what the sweetener used is? I have kids and I let them have flavored milk occasionally. It is not a staple in their diet, for sure but I see no harm in it every now and them. But I will only purchase flavored milk that uses sugar as the sweetener. Regardless of what the front says about how great and wonderful it is. The ingredient statement is my go-to information to make sure I am buying them what I want them to have. Kathy, you are showing your ignorance. Dairy FARMERS bend over backwards to see that the public gets fresh, wholesome, unadulterated milk. The companies that BUY the milk from farmers and process it (pasteurization and homogenization) are the ones who make the products that have additives in it, You want to call names? Go to your local store, look on the jug and see who the processor is (that’s the name brand, FYI) and go call them names. Thanks, dairycarrie, for clarifying. I’m one for taking my reading glasses and finding out what’s in my food, not leaving it up to the package (marketing) to tell me what ingredients that are in my food. I think the people’s posts above, that say they are too small, or saying they need to be posted on the front are just excuses made, so they can complain about what the food industry is “hiding” from them now. Thank you for your openness and willingness to explain what is going on, from your perspective! Aspartame is, by far, the most dangerous substance on the market that is added to foods. It is responsible for headaches/migraines, heart palpitations, fatigue, irritability, tachycardia, insomnia, vision problems, breathing difficulties, anxiety attacks, slurred speech, seizures, nausea, numbness, muscle spasms, weight gain, depression, vertigo, memory loss, and joint pain. According to recent studies it is also responsible for triggering or worsening brain tumors, multiple sclerosis, birth defects, epilepsy, chronic fatigue syndrome, Parkinson‘s disease, Alzheimer’s, mental retardation, and diabetes. But i guess that is all better than overweight children? I read the petition and am still disgusted and appalled that the dairy industry would have the gall to knowingly want to poison anyone. You all realize that aspartame is an illegal substance in every other developed country, right? It is not suitable for human consumption. You can thank Donald Rumsfeld and Monsanto for making it legal here. OK, we understand how you feel but do you think it’s OK to mislead people about the meaning of the petition? I want people to voice their opinions but I want them to be fully informed about the issue. Which is why I posted this in the first place. I have read the petition and am still confused (without a hidden agenda, I must be one of those with low reading comprehension skills when it comes to legalese). From what I gather, the “IDFA and NMPF request their proposed amendments to the milk standard of identity to allow optional characterizing flavoring ingredients used in milk… to be sweetened with any safe and suitable sweetener—including non-nutritive sweeteners such as aspartame…”. I may be wrong, but I believe this means that they want to be able to add aspertame to milk. I also read that “petitioners state that milk flavored with non-nutritive sweeteners should be labeled as milk without further claims…”. I don’t understand how this implies that they will include on the label that the milk contains aspertame. 1. They want to be able to add aspertame to milk. 2. They don’t think it’s necessary to include it on the label. Yes, they want to be able to add aspartame to some flavored milk in place of sugar. It will still be identified in the ingredient statement on the label. If you go back and read the screen shot I included you will see that it will still be included in the ingredient list. Thanks for the clarification. 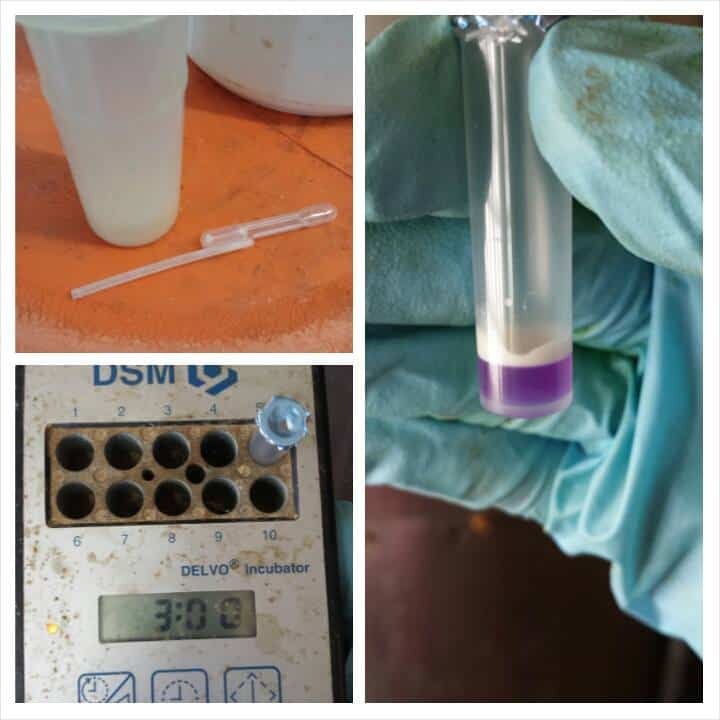 To summarise, the IDFA and NMPF want to continue to identify milk-based products that currently contain sugar (e.g. chocolate milk etc) as “milk” (i.e. instead of “diet milk” or similar), even if they contain aspartame. The consumer will be able to determine the difference by reading the list of ingredients. Correct? Carrie… keep up doing what you are doing. Informing the minds of many! To those that have already commented that said you just have to look for ‘reduced sugar’ to know that non-nutritive sweeteners have been added, that is no longer true. Take Swiss Miss for example. Swiss Miss was my go-to cocoa since I have loved it since I was a kid until one fateful day I took a swig and my tongue started to feel funny and 5 minutes later that lovely throbbing started in my right temple… the migraine was here. Artificial sweeteners of any kind give me a migraine within 5 minutes of ingesting it. Since I had noticed that SOME of the Swiss Miss packs touted REDUCED SUGAR I made sure to steer clear of those, but I looked at the back of the box and there in tiny little letters, aspartame, then further down, sucralose. So not all companies tout reduced sugar… you HAVE to look at the back labels to know what you are ingesting now in the US. I’m still concerned about the 17 other milk products that they could put aspartame and other sweeteners in such as dry milk, half and half, yogurt, whipping cream, heavy cream, etc. I read through as much of the FDA mumbo jumbo as my migraineous brain could handle and I know that it means to focus on sweetened beverages but the wording, even with the parentheses, does state that it does want to change the identity of milk. Even if it is a marketing plow to make the nations children less fat, can’t we do that without non-nutritive sweeteners? I’ve seen too many ingredient labels who slap things like “Spices” or “flavorings” which hide MSG and sulfites and nitrates which also trigger my migraines on their labels to trust half of what I’m eating and have to go fresh and cook most of my food myself, and if I can’t even trust the dairy that I’m drinking then that is a very sad day indeed. It’s only a matter of time before it’s petitioned to allow non-nutritive sweeteners to fall under the category of “natural flavorings” to protect trade secrets. And it’s only a matter of time before Monsanto or some other company with close ties to the FDA pays them enough for them to allow it. I too just discovered that Swiss Miss had added aspartame and sucralose, after noticing the bitter aftertaste. I called Swiss Miss and they changed packaging, etc over a year ago. I was told there are only two variations that only contain sugar. I was horrified that I now have to read the ingredients to see if there are sugar substitutes in the foods I buy. I try to avoid all fake “sugars” for my kids and myself. Ugh. Horrified to have to read the ingredient list on food? Really? Why is that horrifying? I understand why you say it is horrifying. It shocks a person when you discover that something you thought you knew changed to something you don’t trust. It makes you realize that you can’t trust products to be free and clear of additives that are potentially dangerous to your families health. It makes shopping a completely different experience when you have to check everything, even items you’ve bought before that were previously ok but maybe aren’t this shopping trip! I am also an annoyed parent. Hi Carrie, I appreciate your post to help me understand the controversy. Also, thank you for the link to the petition. Would you mind answering one more question? I understand, and believe, that the aspartame, if approved, would conceivably go into flavored milk. Why, then, is it being petitioned to be able to put aspartame (or other non-nutritive sweeteners) in 17 other milk and cream products including heavy cream, sour cream, half and half and other milk products that are NOT considered sweetened? The full list is in section 1 of the petition to which you linked. Although ,I think aspartame should be banned completely, I can understand people pushing for its use in sweetened products ( a reason why I always have to read labels!). What I don’t understand is why sweeten cream or sour cream or other items that are not sweet? Good question. I don’t know the answer. However I would think that it would make sense to apply for several different dairy products at once rather than have to apply for each one if the need came up. Many of the other dairy products listed do contain sugar so it would be logical that the manufacturers may at some point want to use what they are proposing if it is passed. I think this is why people get skeptical. Sugar, corn syrup or aspartame are not improvements to our food that isn’t supposed to be sweet. Thank you for your response. I know you are catching the heat here when you’ve just explained petition. It was helpful to me to realize the distinction between labeling and an ingredient label. Glad I could help clarify it for you. Sugar doesn’t need to be added to sour cream, so why are they petitioning to add aspartame to it? Additionally, the dairy industry is setting this up as a “Let’s get more kids to drink milk!” so why the need to have those additional products on the petition? And regardless of how it appears on the label, aspartame milk should not be an option for children to drink at school. It’s bad enough sugar milk is an option but at least we know more about the long-term health consequences. I don’t know the answer but I would think that it would make sense for them to just put all similar dairy products together instead of doing one at a time. For a slow as our government runs! Thanks for this post. I have read many sensational stories about this issue and it is nice to get a dairy producers perspective. I haven’t read the whole petition, but I was hoping that you could clarify something for me. The screenshot above says (paraphrased by me) that the petition will allow producers to use safe and suitable sweeteners to reduce the caloric content and still allow it to be called milk. While I understand that the intent of the producers is to allow flavored milk drinks to be labeled as milk– I read that to say that ALL milk will be able to have an artificial sweetener added and still be labeled as milk, not just flavored milk beverages like chocolate or strawberry milk. So, my question is–will milk processors be able to remove the naturally occuring sugars (lactose) from regular white milk, replace it with a sweetener like stevia or aspartame and still call it milk? So I suppose they could kind of do what you are asking in theory but I don’t believe there would be any practical application for it. Carrie: As someone who has enjoyed “natural” milk most of my life, I do not see a need to add sweeteners to a product that in its normal state is sweet enough to satisfy most individuals. However for those products that are sweetened I would much rather have the calories associated with natural sweeteners such as sugar, stevia,etc then products that are man made and have been shown to be carcinogens. I can exercise and burn off the excess calories however what can I do to remove man made poisons from my body? But thank you for taking the time to clarify the true bill. I still do not see a need for children to drink sweetened milk products however that is unto the individual set of parents but they should be able to make an informed decision as to what types of sweeteners they want their child to ingest, which by not having to label the product as containing Aspertame they are not being given that option. Thank you for your respectful comment. Nonnutritive sweeteners would also include things like stevia. Of course aspartame has grabbed the headlines. 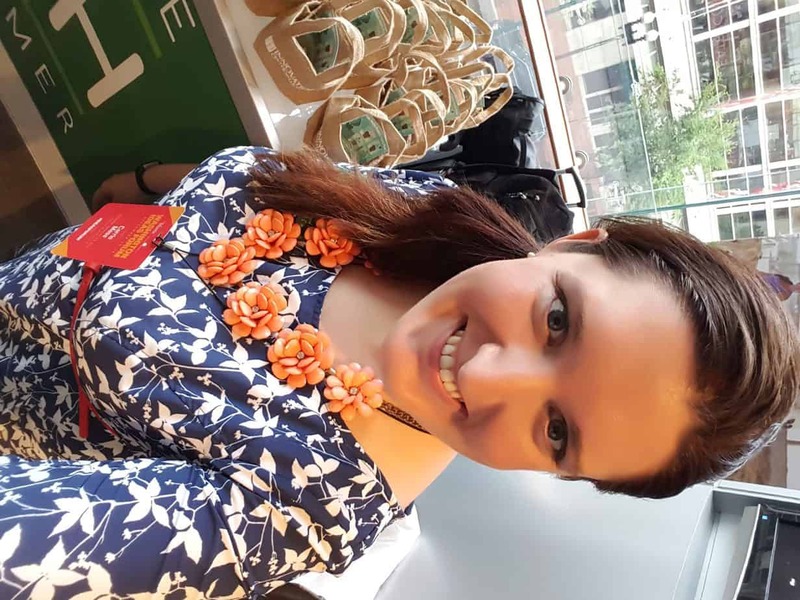 Great blog Carrie and awesome discussion. Not only is it important to read labels AND the ingredient list in dairy products, it is important to read BOTH in ALL food products. Many drinks are full of dozen of ingredients that most people don’t even know what they are. And it isn’t just in drinks, it is also in prepared and packaged food. Remember that labels aren’t always totally truthful…ingredient lists are! The sugar in white milk is from lactose and is a naturally occurring sugar. My understanding is that lactose breaks down quickly in our bodies which is why it raises your blood sugar levels quickly. No one is adding sugar to white milk. There would be no reason to and if they did it would have to be listed in the ingredient label. I don’t have the time to research and discuss this issue as completely as I would like — I have fences to maintain, animals to feed and care for, and a business to run — so I’ll make my points brief and probably do some simplifying and paraphrasing. 1. I believe that part of the solution to the food system component of our country’s public health problems is a MORE informed populace, not the opposite. If we want aspartame to be treated the same as artificial flavors, then we should label artificially flavored strawberry milk as just that. You said, “The FDA is very picky about what you are allowed to use as an ingredient and still be allowed to call the product milk. Because they want you to know that what you get is what you meant to buy.” If that is true of the FDA, then why would you expect or want them to take away a rule that requires food marketers to tell you up front what you are getting? 2. Your trust in our government and the powerful businessmen who control it is scary. The dairy industry’s motive for this is purely to increase profits. If their goal was truly to make kids’ school lunches more nutritious, they’d be lobbying for feeding our kids real milk instead of flavored candy milk. This is purely a response to public concern that kids are consuming too much sugar, much of it in the form of sweetened milk products. 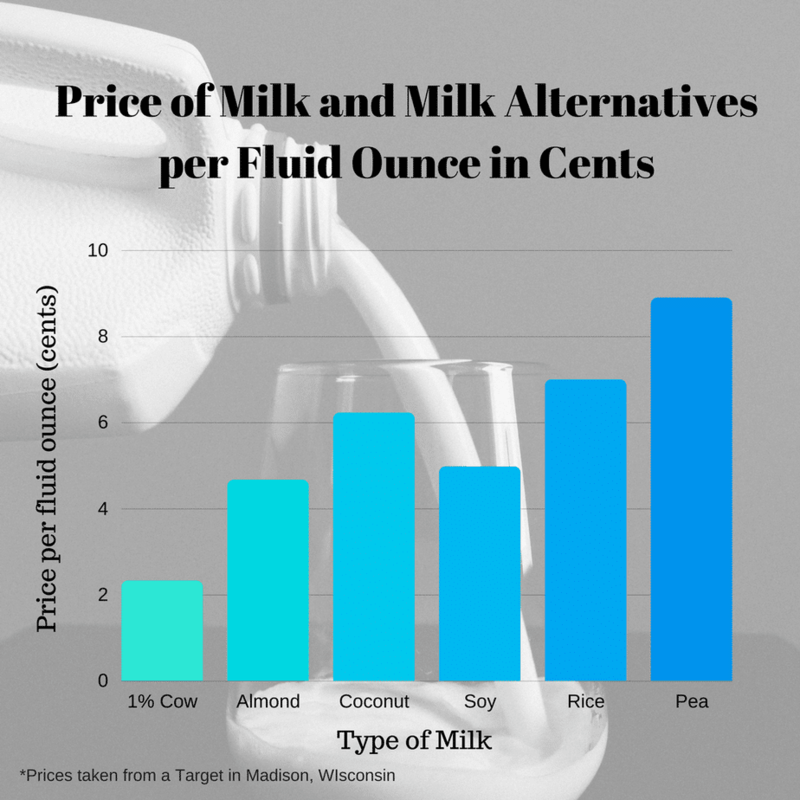 The industry knows (and has said so themselves) that kids drink more milk if it is sweetened. This is their way of keeping kids drinking more of their product while mollifying the valid concerns of the public. 3. Who’s in charge here anyway, the grown-ups or the 6-year-olds? Who decides what gets served in school cafeterias? Offer the kids only real milk and they will drink the real milk. 4. Or if the goal is for kids to get all those “essential vitamins and nutrients” in a beverage that they will willingly consume and that doesn’t contain added sugar calories, why don’t we just feed them vitamin- and nutrient-fortified diet Pepsi? I’m sure that would be much cheaper to produce, transport, and store. 5. In the petition, the petitioners themselves state, “IDFA and NMPF argue that nutrient content claims such as ‘reduced calorie’ are not attractive to children…” Maybe we could all learn from the uncorrupted instincts of our own kids. 6. As you may be able to detect from your website analytics, I ended up here by Googling “why does the IDFA want to put aspartame in milk.” I’ve read a number of alarming articles on the internet about this issue. But I don’t trust the bloggers when they tell me something’s bad (or good for that matter). I assumed the IDFA at least claimed to have good reasons for wanting to do this, and for wanting to change the labeling requirements. But after reading the petition, the whole idea sounds even more ridiculous and outrageous. 7. Regarding the 17 other products, you say they’re just kinda tacked on there for efficiency, to avoid future red tape, don’t worry about that stuff, it’s all okay. Again, that’s the kind of trust in government and big business through which we allowed greedy powerful men to destroy the worldwide economic system while they reaped huge and unprecedented profits, and our solution was to funnel billions or our hard-earned tax dollars directly from our pockets into theirs, so they could remain solvent enough to do it all over again. And just as with the SEC/Banks relationship, the FDA/IDFA is another case of the wolves guarding the hen house. And furthermore…Oh well, nevermind. I have animals to feed and work to do. I’ll come back later. You know I am pretty busy myself but I refuse to let that be an excuse to be uniformed about my food or to not take the time to be an agvocate. Your first comment implies that strawberry milk doesn’t tell people that is may have artificial ingredients and in fact it most certainly does, right on the ingredient statement, which is where aspartame or stevia or whatever non-nutritive sweetner they would use would also be listed. I don’t think kids not wanting reduced calorie anything means that we should follow what kids want to eat for our diets. If the label has to identify on the front that it is “Strawberry Milk” or “Chocolate Milk”, in other words, not just milk, then it stands to reason if anything is going to be added to the milk, be it chocolate or aspartame or Stevia, or sugar, then it MUST be noted on the front that it is something other than plain milk. I suppose it could say “sweetened milk” then it would be up to the consumer to look at the ingredient list to see what it’s sweetened with, but it would be absolutely wrong to be able to add anything to milk, without it being clearly identified on the front label, large, just like it is when chocolate is added. Of course, I don’t buy milk from the store any longer, I get it from a neighbor down the road, so I admit I’m not current on milk labels in stores. I gave up trusting mainstream grocery store food years ago since I don’t trust the food or the labeling, and buy from local, organic farms instead…and I’ve been much healthier for it. Wow, I agree with Bob, There is way too much trust goin on. How can you just blow off the fact that other countries totally ban the stuff, and we just assume they are wrong, cuz FDA thinks different. Those countries are way healthier than we are, and we can’t figure out why. We have a powerful junk food industry, and we are going to just let our processors take our industry down to their level to increase their profits. We have paid millions of dollars to build up the image of our dairy products, and now need to show pride in good products instead of deceptive practices. As producers of this great product, we feed our cows a well balanced diet of only good feed, and they would all be sick if we fed them Twinkies and Pepsie, and some urea for protien, but that is about what we feed our kids. No other country feeds so much junk to their kids, and no other country has so much asthma, alergies, diabetis Atn def disorder or suicide, and you tell people who share their personal stories of problems with aspertame to read the fine print, and don’t get excited. This whole idea is to sell more milk in school, and none of the kids in the school are going to read the fine print. After talking to someone at the dairy council and a milk coop, It’s not about not labeling the aspartame in the ingredient listing on the back. They don’t want to have to list it prominently on the front of the milk packaging where it is easy to see. I hope they have to continue to prominently display aspartame on the front or whatever man made derived sweetener they use. It is a sad day when you have to question the integrity of dairy products. Milk being one of the most nutrient rich products out there. Need to keep milk real. So if they use Stevia in place of sugar in chocolate milk will you have a problem with that? Carrie, very interesting blog. I’ve read multiple posts so far this morning. Well written, and I like seeing the “opposing” side’s point of view. But ultimately, for all those who disagree with any or every part of our food industry, and are disturbed by the need to check labels or dislike conditions that animals are kept in YOU HAVE A CHOICE. YOU CAN BE A FARMER. Not a farmer for the masses, but a farmer for yourselves. YOU can raise a flock of chickens. You can give them antibiotics when they’re sick or not. You can keep them in cages or not. You can keep them in a run or let them loose on your property. You can eat the chickens or just eat the eggs. Turkeys, rabbits, chickens, ducks, geese, and goats are all great for little farms. If you live in an area that doesn’t allow gardens and chickens YOU can work on getting that changed…or you can move to a little plot out in the country that is all your own. You don’t need a lot. 5 acres will serve a small family very well. YOU can reduce your dependence on big agriculture or eliminate it all together if you really do want control over your own food. For those that find they cannot get laws changed or cannot move, visit your closest farmers and SEE how they operate. Ask questions. If you’re near an Amish settlement, find out what modern day conveniences they might now be using, and buy from them if you approve. If you are someone that likes meat, but cannot face your food first, you have the option to be a vegetarian all the same. Buy your produce from farmers and Amish settlements in BULK and use YOUR OWN TIME to process and store YOUR OWN FOOD that you will put IN YOUR OWN BODY YOURSELF. A HUGE problem with society today is being taught that we don’t really have choices when we do, and the idea that if you don’t LIKE a choice or it isn’t convenient then it isn’t a choice at all. As much as I dislike the idea of chickens in cages with their beaks cut off and animals held in stalls where they cannot move, I also consider the fact that feeding 300,000,000 people is a lot of pressure!!! Producing food enough to feed that many people– having to pump out hundreds and thousands of pounds of meat, dairy, and vegetables each and every year, and to have to do so while still making it affordable. If you don’t like it! If it feels WRONG! Don’t complain, make a choice!! !